May the new year and decade bring good food, good health and good times. It's been a while since I came here to post a new entry. I look at pictures, imagine various entries, but they fail to materialize. 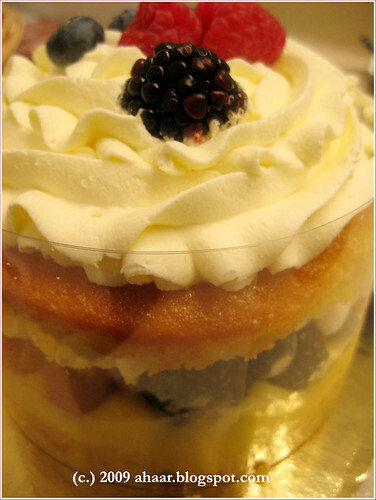 So, instead of coming up with excuses, I am going to share some pictures of the food that we've enjoyed this month. There are many more pictures to share and hopefully the list of posts under "drafts" will get smaller in the coming year. 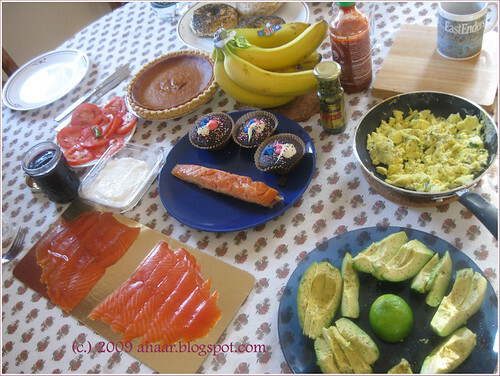 We enjoyed a scrumptious brunch of smoked salmon, bagels, capers, avocados, tomatoes, scrambled eggs and cupcakes early this month. This was dinner during one of the busy December weekdays. Butternut Squash soup with fried onions on top, buttered toast and a simple tomato and avocado salad. This was a weekend lunch, one of the few moments of relaxation. 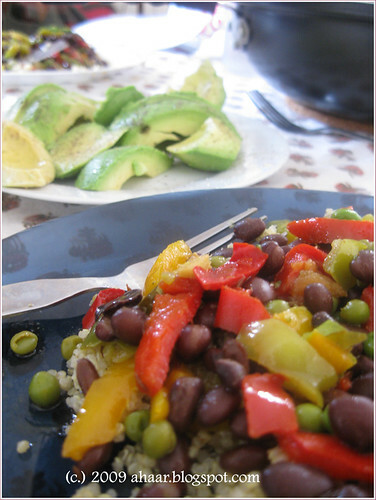 Aswin made this story-fry with black beans, peas and peppers and served it with quinoa. And yes, we had avocado on the side. We also have some news to share. We are getting ready to welcome a new member to our family! I am due in January and at present am enjoying my vacation, getting the house ready and waiting. I may not post as often, but will check in chance I get. After several "will it or will it not" moments, snow has covered the ground, temperatures have fallen and there is no denying that winter is here. The first snow, undoubtedly, is the prettiest. I looked out to our backyard today morning and there was this pristine blanket of white covering everything. 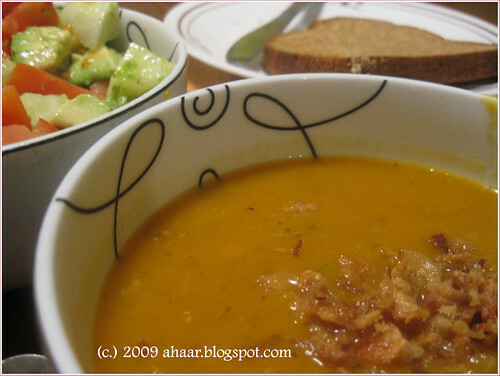 With winter knocking at our doors, it's time to post this recipe I made last month when we had some nice weekends. It was for a friends dinner party and everyone enjoyed bhelpuri. 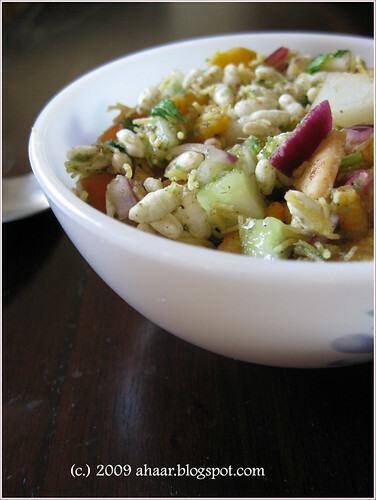 Mix puffed rice, sev, and broken papadi in a large bowl. Add onions, tomato, cucumbers, boiled potato. Then add green and tamarind chutney as needed. 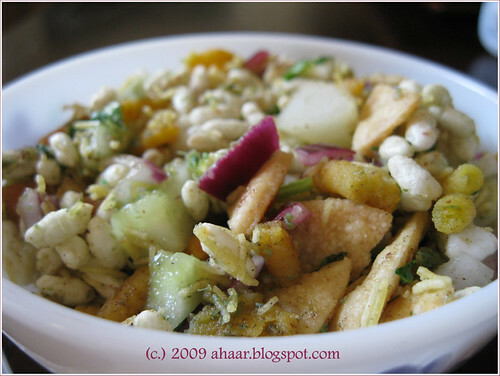 Mix well and garnish with sev and cilantro. You can store the extra green and tamarind chutney in an airtight container in the fridge for a couple of weeks.